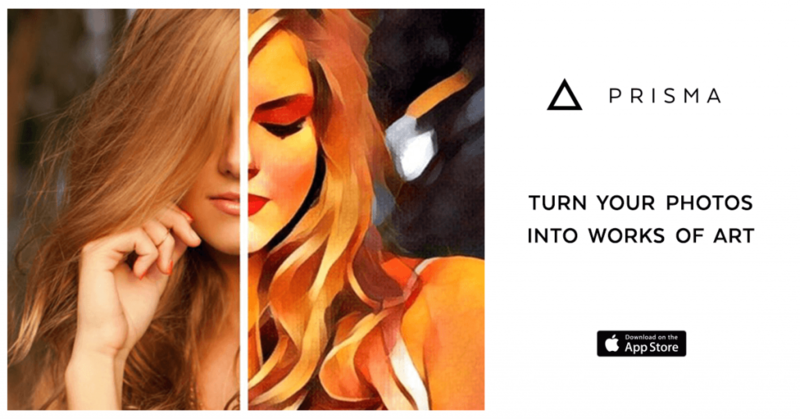 The photo-editing app Prisma quickly went viral in the App Store. The team understood that even the slightest conversion uplift meant millions of extra installs. So they decided to optimize their app store images. Thanks to smart A/B testing, the app managed to achieve 19.7% conversion growth in no time. Prisma Labs is a mobile technology company specializing in deep learning and consumer products based on Artificial Intelligence. Their photo-editing application Prisma was chosen one of the best apps two years in a row (2016 and 2017). App Store and Google Play don’t always agree on things, but this time they unanimously picked Prisma as the app of 2016. MSQRD was also named runner-up for best app of the year for iPhone and a top trending app of 2016 for Android. What do Prisma and MSQRD have in common (apart from both being photo/video apps, obviously)? They both scaled their viral success using Splitmetrics A/B tests to optimize their store images and improve the conversion rates. We’re happy and proud to have been part of these great stories and would like to share our chapter with you. 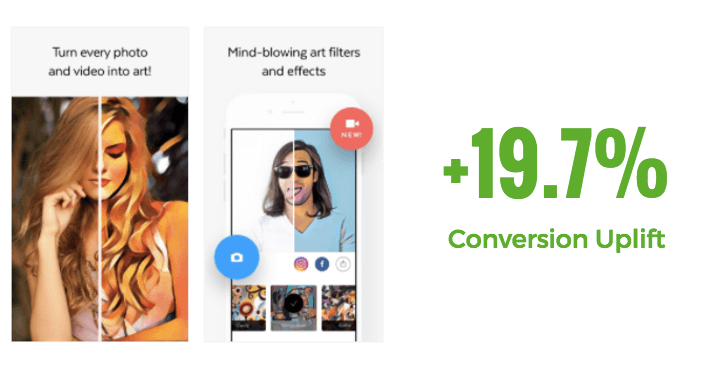 When Prisma’s viral growth started to explode, the team behind the app quickly realized that at this scale even a slight increase in conversion rates will result in millions of additional installs. 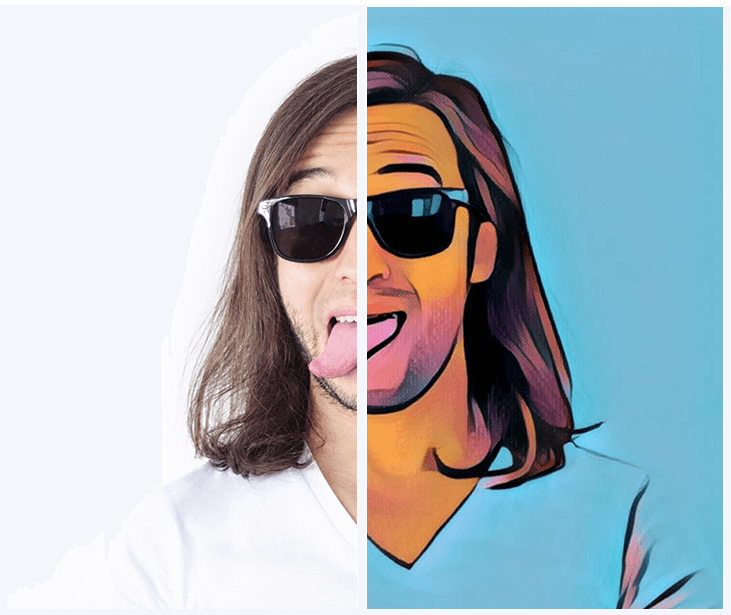 SplitMetrics was chosen to optimize Prisma’s app store images on the App Store and we worked closely with Prisma team to make sure that we leverage the media and viral spotlight to the fullest. Now we’re happy to share some of the successful experiments that we ran as well as the ones that didn’t turn out as we expected. When we started out, Prisma was already a hit. It was all over the news, so we didn’t want to mess with anything that could hinder app’s recognizability (so icon tests were out of the question). We went after the low-hanging fruit: optimizing the screenshots as they have the biggest impact on conversions. For our first experiment, we chose the low-risk/high-reward strategy: tweaking the screenshots according to the best practices. Note: we also experimented with the order of app store images, but the original positioning was actually the most effective. The result? 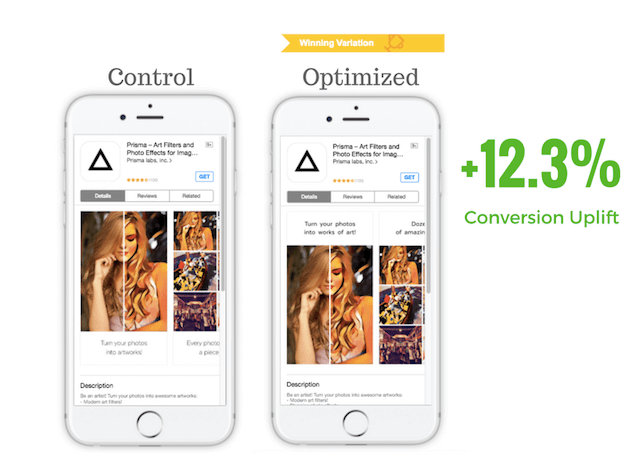 The impressive 12.3% uplift in conversion rate for the optimized variation of app store images. We didn’t sit idly waiting for the results of our first experiment. Instead, we started optimizing Prisma’s description. We tested a number of approaches: opening on a call to action, bullet lists, flashing cool press reviews, bragging about top chart positions, etc. Adding bullet lists and using a prominent call to action both seemed to help conversion rates. 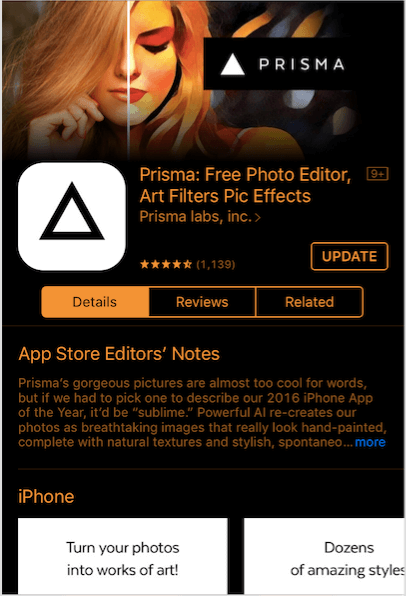 However, while we were running the experiment Prisma became App Store Editor’s pick. This also meant that the app now had Editor’s Notes description on top, which moved the regular description way down below the fold, rendering its impact on conversion insignificant. So we decided to stop experimenting with the description. However, we don’t recommend following these footsteps unless you have Editor’s Notes. So, we shifted our focus back to app store images. For those unfamiliar with how SplitMetrics A/B Testing platform works: it creates web pages emulating the App Store where you can change and edit any element of the page (screenshots, icons, etc.). You then drive traffic to these pages (usually from ad networks, cross promo or your website) to see what works and what doesn’t. Get ideas for screenshot imagery. Given the nature of the app, we were particularly interested in 2 things: which images to feature and which Prisma filters to apply to them. So we created a set of app store images depicting people and also some inanimate objects. Then we processed them with the most popular Prisma filters. After that, we launched a series of Facebook app install ads for Prisma featuring these app store images as banners to shortlist those that perform best. We also made sure to throw in the girl from the first screenshot into the mix to use it as a performance benchmark. We targeted the ads at users broadly interested in photography, selfies, photo apps and art to get faster results and better conversion rates. Yet, we didn’t want our targeting to be too narrow since Prisma is really a mass market app. However, it turned out that none of the contending app store images seemed to be beating the control by any significant margin. The Variation C was performing only slightly better, but we decided that the difference wasn’t enough to take action on it. Moreover, the image of the girl in the first screenshot was picked up by the media, so she was already recognizable and was adding to the app’s credibility, which was critical since the App Store was swarming with copycat ‘prismas’. We actually were onto something here for a future experiment (so read on…). As Prisma team was getting ready for a major update – introducing video filtering, we were tasked with reflecting this in the new screenshot. 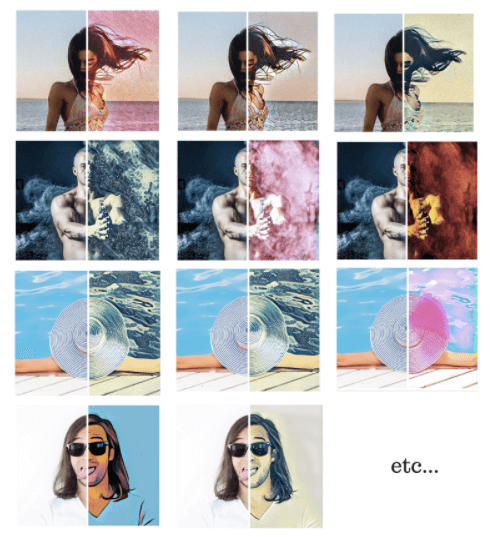 It was a big deal and we needed to draw attention to the new feature within app store images. And we had just the guy for the job. This guy performed really well both in the split test (even though he didn’t win) and as a Facebook banner so we decided to give it another shot and placed it in the second screenshot. We also added symbols for photo and video to convey the idea of the update and altered the first caption to say ‘Turn every photo and video into art’. The above-mentioned update resulted in the incredible 19.7% increase in the conversion rate. Make adjustments and have another go at it. And always, always repurpose things that work: Have a really great performing banner? 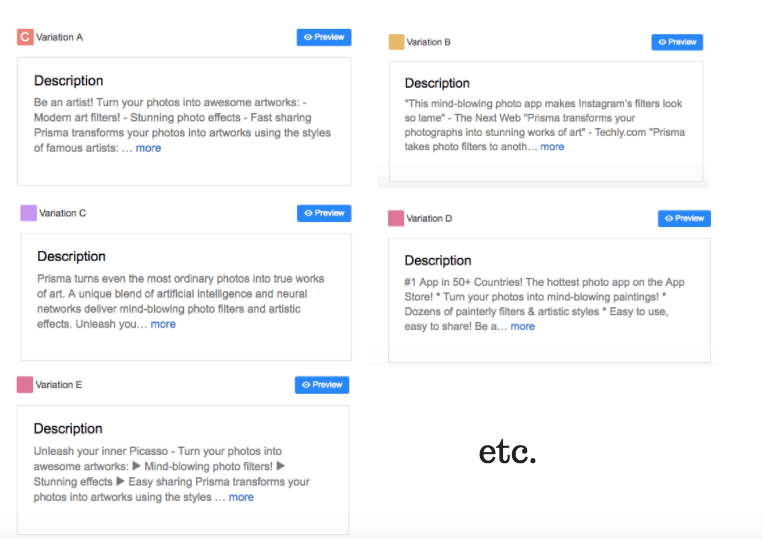 – See how it performs in app store images, in-app purchase dialogues, etc. SplitMetrics will always be happy to help you get your app on the ‘Best of the Year’ list.